Background: This June 2010 discussion between Ashima Kaul and Katherine Marshall reflects above all on women’s roles in the Kashmir conflict and how religion is involved. Ms. Kaul tells how she reengaged in Kashmir after 1995, (born there, she left as a child). She was drawn by her insight that women's stories were absent in media coverage of conflict there. She realized that fundamental changes in how Kashmiris saw themselves were related to changes in Kashmiri Islam. Positive change is possible but very difficult, above all because of what she terms cultural insecurity. As Kaul has worked with women in Kashmir, from many different communities, she has recognized the special roles that women could play in recovering and making useable and powerful mostly lost cultural memories and symbols. Using creative vehicles like theater, film, and storytelling, but also focusing on women's political roles, she highlights the importance of bringing women into political space where they can bring their insights into policy circles. In parallel, efforts to engage local Muslim religious leaders in work for peace can help in tempering forces obliterating traditional Kashmiri Islam, restore confidence, and empower women. How did you get started? How did you become interested in this work from the beginning? I was born and brought up in Kashmir. My families are Kashmiri pandits, as Hindus in Kashmir are known. It is a miniscule minority in that part of the world. Today, the pandits are mostly living in camps outside the Kashmir Valley in Hindu majority region called Jammu, culturally and ethnically different from the Kashmir Valley at a distance of 300 kms from it, or beyond in the other states of India, and many now live outside the country. When the troubles began there, in 1990, my father, who was in the state police there, was posted to Delhi, then back to the Jammu region. The family wanted to go back to Srinagar in Kashmir Valley but because of all the turmoil that was happening there, we could not. However, my extended family and relatives were all living there and had to leave in 1990 when the pandits had to leave under threat and fear. So my immediate family settled back in Jammu and I continued my studies there. I always wanted to go back to Kashmir, but instead left for Delhi for work. I got married, had a baby, and began to work at a freelance journalist contributing to national dailies in India. I was not at all politically conscious or politically aware at that time and was not then engaging at all with what was happening in Kashmir. What led me back to Kashmir was the pursuit of a story. I was in Kashmir in 1996, at my parents’ place, with my daughter, on winter break. A friend told me about a situation, suggesting that it would make a good article. So I went, on his suggestion, to a government hospital. There, I found some 200 women, who had come there from very remote places in the Kashmir Valley to Jammu hospital. They had come to avail themselves of family planning facilities. It was very cold, and they were sitting in row, holding their little babies, some with their husbands. I was shocked at the sight. Why had they come? What they said was that in their areas militants had banned family planning, saying that it was un-Islamic; they did not want to risk themselves there, so had come to the central hospital. I realized then that, in whatever we were reading in Delhi, and at that time the electronic media had not yet come into full force, women’s voices were not being heard at all. What we were reading about was gun battles, security forces, political relationships, counterinsurgency, special groups, and related news. There was nothing about what was happening with women. And I was very struck by the comments I had heard, that something was “un Islamic”. When I was growing up, that would never have been said. Kashmir had been a very different place, with a rich and composite culture and freedom to express ideas. What was the nature of the culture that was being lost? What I remembered was that we were Kashmiris. The religious, Muslim, identity was never part of the cultural discourse, or of every day existence. To hear something like that—that something was “un-Islamic”—really pushed me to go back to the Valley to find out what was happening. How did you move from journalism to peacemaking, and how did you come to focus on women? In 1996, I went back to Kashmir, as a journalist. It was frightening, given the violence and tensions. I dropped my maiden name, and did not disclose who I was for the first two years. I went everywhere nonetheless, visiting all parts of the Kashmir region. In that journey, I have met almost every kind of women and almost all of them had suffered terribly. Some were direct victims, some had lost sons or husbands, or they had disappeared. Some women had been deserted, or exploited. I also met women who were part of women’s wings of militant groups. In short, I met all kinds of actors. And after that, I went to the camps, where I met displaced pandit (Hindu) women. The situation of all these women was heartrending. They were, under the most terrible conditions, trying to keep their families together. They had little children to take care of, and had no relief or support. What pained me the most was the degree to which these communities had suddenly become Hindus and Muslims. Kashmiri pandits hated Muslims, and vice versa. There was a bundling of what had been shared cultures, each one rejecting the one’s history. I came to believe that it was very important that they hear each other. My aim at that time was to bring them together, in a platform, so that they could sit and listen to each other. In 2006, I joined, as a consultant, a roundtable program of WISCOMP (Women in Security, Conflict Management, and Peace), that aimed at breaking the silence. We organized a huge round table event in Delhi. It brought together women from different parts of Kashmir, from different traditions and backgrounds, to listen to each other. It was a very emotional platform for many of them. They had not met women from other communities for many years. The following year we organized a follow up event in Kashmir, and a group of us formed Athwaas, which means “holding hands.” The group that met was mixed, with Hindus, Muslims, and Sikhs. That was when I was able to articulate and carry forward my dream of bringing these communities together. A group of 10 of us travelled together in the Valley, visiting camps and village, and listening to women’s narratives, absorbing their realities, and internalizing the pain that we encountered. As we did so, we ourselves went through a learning process, developing our skills for listening and dialogue. It was during that process, I think, that we began intentionally to start recovering the cultural symbols, language, and collective memories that we shared. The common culture I am referring to came from the tradition of the Bhakti movement, which was part of the history of that entire sub continent region. Going back to the thirteenth and fourteenth centuries, the region was not divided into India and Pakistan. The culture and history were shaped by the emergence of saints which especially saw the emergence of women saints. Bhakti means devotion to god. This pattern which began as early as the ninth and tenth centuries, began in Southern India, and spread north. In the thirteenth and fourteenth centuries, there were many women saints, including Lalleshwari or Lal Ded in Kashmir. She was one of these women saints, and she is claimed by both Muslims and Hindus as their own. The poetry and spiritual traditions of that era are still resonant today. What were the factors that were causing the culture to change, and how was that manifested? Because of conflict and the changing culture in the Kashmir region, a different and increasingly Islamic discourse has come in. The new generation, post-1990, is therefore losing an important cultural link. One of our efforts has been to bring the history and traditions that included these mystic saints into the everyday language of men and women. The means we used included writers’ workshops and other vehicles that allowed people to recover these cultural links. That bonded us, in spite of the fact that all of us had very different political positions. We retained those positions, but the cultural approaches we were promoting created a common ground. We all agreed that we wanted to support dialogue, and non violent ways to end violence. That was a powerful commonality. What kinds of women were involved in this effort? The group came from very different professional backgrounds: government civil servants, educators, and professors, all with different conflict experiences, and different life experiences. Some had encountered directly violence or displacement, while for others their experiences had been more political. One member, for example, wants Kashmir to separate entirely from India, while others want it to remain part of India. We came from different religions and social groups. But, interestingly, because of the common cultural links that we were able to recover and retain, religion never became an issue among us. We were Kashmiris, torn apart by political ideologies, and brought together by our common culture. The group found important common spiritual strains that bonded us. As we listened to the women’s narratives, we realized that they had a lot of expectations of our group. They wanted us to do something for them. So, as a next step, we started similar circles at the grass roots level, that we called samanbal spaces. The term samanbal means the places where women from villages could come together. The workshops we organized involved capacity building and psycho social healing. But they also focused on economic aspects, because that is what the women were interested in. The work we did involved income generating skills and explorations of potential sources of income. This served to bring groups together, and helped to create their own little space. Our idea was to explore how we could help bring about a shift, where women could begin to claim public spaces and thus become agents for change. Then they could take on the onus and responsibility for their lives, and would be able to make their own choices. At the grass roots level, we found, women initially had difficulty in using some of the skills we were using in our workshops. Many of them required carefree movements, expressions that, we came to realize, were thought of as un Islamic in the contemporary communities. The women were facing pressures from some community members, especially the men, who were telling them that they could not do this or that, even things like just singing or dancing together. They had all kinds of inhibitions and reservations that came from the contemporary society and popular opinion. We had to address those attitudes. A powerful tool that we found was to bring the women mystic saints into the discourse. We found that that made our approach somehow acceptable. It led me to conclude that one vital area where women can play important roles is in recovering cultural symbols. How have you carried this insight on the importance of women and cultural symbols forward? Both as a member of the group, Athwaas, and personally, I have pursued this thread in many ways. Among them are my writing and several documentary films. One film has focused on my personal journey, and emerged as a 30 minute documentary. I am now working on a film about women politicians. How have you come to see the Kashmir challenge through this work? During this whole process, in my own personal journey and what I have been observing at grass roots, I have been struck by how deeply Kashmir has changed in terms of its culture. The Islam which I had known and what was the deep Kashmiri tradition, as I learned more about Kashmir’s history, was a soft and inclusive Islam, a religious tradition suffused with the traditions of the Persian Sufi Sayyids that, in Kashmir, was assimilated with the local Rishi movement. It was led by Muslim saints, and reflected parallel in the Shavaite (Hindu) culture. There were Hindu women saints, who were Shavaites, and the coming together of Sufi and Shavaite traditions, over years and years of Hinduism, also with strands of Buddhism, made up a special Kashmiri culture. The Sufi shrines were open to all, and everyone went there. These were shared, collective spaces. Both men and women went to visit the tombs of Muslim saints, who were buried in these shrines. Muslim and Hindu neighbors sought blessings from them. Apart from the shrines of the saints, there was a system of local peer religious leaders, who were not saints, but had large followings. Many mosques came under them. These Sufi peers and the Sufi orders had large followings in the villages and the leaders exercised much influence on the people. But over the last 10 to 15 years, since the current phase of militancy started in the Valley, there has been a concerted effort to transform this Kashmiri Sufi Islam into something different, influenced above all by Saudi Arabia. This Islam is far more patronized, and it is different from the Islam that used to predominate. It allows little space for other faiths to persist. Around 1990, there was a huge exodus of the pandits, the result of many threats and killings. This happened at the same time that the changes in Islam were starting. The changes were evident in the kinds of prayers that were being offered in the mosques; some mosques were forcibly shut down, linked in part to fear of guns. There has been, because of this atmosphere of fear, little resistance. What is the present situation? Do you see results from your work? Slowly, bit by bit, things are changing. I have started to see some grounds for hope. One strand of hope has grown from our growing awareness of the importance of shared spirituality. This has led us to work more and more with local religious leaders. While we were working in women’s groups, trying to recover cultural links, we came increasingly to share our own spiritual experiences. As part of this effort, I thought it was important to intervene with the local Sufi leaders. Many of them have large followings in the villages. I am now beginning to and exploring possibilities of using religious resources which are Islamic, are known, and are integrally part of the cultural ethos. Those religious resources have been responsive to the stories of these Muslim saints, but also to modern conflict transformation theory. So we feel this is something we should be doing. Thus, parallel to WISCOMP, I also founded an organization called Yakjah Reconciliation and Development Network. It represents a network that works with youth, women and spiritual leaders who come from Islamic or Hindu backgrounds. We use above all visual media and multi media. Trough Yakjah we are working to acquire funds and resources, and have been able to design a basic structure for activities. That offers a new form of engagement. Are there Sufi religious leaders today who are women? How have you come to work with the religious leaders in Kashmir? Not really, the ancient tradition of having women Sufi religious leaders seems to have died out. It is challenging today for women to be recognized as religious leaders. That is unlikely to come about until the overall situation for women is changed and new realities created. But if we begin to build and train women to come into other spheres of life, and use religious resources, that will open up space. As we encourage women, they can then intervene on religious issues, in various leadership forms. Women’s roles in communities in Kashmir are challenged today by the Saudi influenced groups, that have a Wahhabi character. These groups have very strong women’s wings, which go from village to village, and use the vehicle of Sunday sermons and others to influence people. All this is promoting a very different kind of Islam, one which teaches that women should not step out of their houses. Because of this kind of reality, we need to act to bring about progressive change. I do not see any efforts along these lines by the government. The whole focus is on territorial security. There is nothing about cultural security, and overall a lack of initiatives in this direction. There is little recognition of the fact of the spread of a different kind of culture that is exclusivist, that tends to homogenize, and that has lots of patronage and resources. Therefore we are reflecting on how to do something that can provide an alternative. We note that the Sufis, the traditional Sufi shrines and other traditions, have no patrons or funding sources. So we need to reach out and do something about that. To this end, I am in touch personally with these Sufi leaders, and looking to any kind of training for religious leaders that is feasible, because they can reach out to hundreds of thousands of people. The traditional Sufi leaders, who are mostly all men, have been receiving many death threats, and many have been killed. When people traditionally go to the shrines, on the anniversaries and birthdays of the saints, the militants and Wahhabis have tried to stop them. But these traditions are very much linked to everyday life so they are deeply rooted. People seek blessings from the saints and go to the shrines for healing. Women go there to weep and cry. The Wahhabis have not been able to cut that connection. But the changes are creeping in. Some are at a subtle level, others easier to see. Madrasas are mushrooming, and at the shrines some cultural symbols are fading away. There are a lot of threats. The names of shops and people’s dress are becoming more Arabic. In their everyday existence, people are experiencing this difference. But they still have another reality, and one reality is not entirely negating the other. One is extremist, and involves the patronage of the gun, and it has no space for expression. But the other, Sufi, reality is still present. I was making a documentary recently about Kashmiri women politicians. In the process, I interviewed religious leaders. Many could relate stories about women in Islamic history who played many roles, including in military warfare, in politics, and as messengers of reconciliation. I reached out to progressive Muslim leaders like those from many Sufi orders in Kashmir). They have a huge grassroots networks, and through their mosques they are disseminating extremist discourse, which restricts what women can do, in the home and in politics. Our workshops keep this in mind and focus on conflict transformation and use of religious, spiritual, and cultural resources to change the trend. The Sufi religious leaders have huge networks of followers and a network of mosques. They have large potential resources for peacebuilding and for bringing about social transformation. We need to build this constituency. What about women’s roles more broadly in Kashmir? Women, despite it all, are coming in at various points and becoming more visible, but they are affected and constrained by the new face of Islam. The opposition party president is a woman. 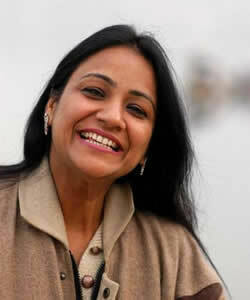 I know that she is a carefree woman, and in Delhi I have seen her wearing normal clothes. But, in Kashmir, she wears an abaya and veil, because of the perception of Islam and women that the Wahhabis have brought in. These changes are affected by global shifts, and are happening in many places around the world. My concern about the shifts in Kashmir comes because this was not there before. There is a quiet, subtle resistance, but it is very challenging for women to come out, because there is the fear of the gun. How can outsiders help to bring about change? Women like us (with an international profile) can engage with Sufi men religious leaders and slowly open up space for women to come into it. It has to emerge organically. Change cannot be parachuted in. What we can do it help create conditions for new kinds of leadership and community understanding to emerge. Strong leadership roles for women have always been there, though to a large degree the community has lost the habit and even the memory. What specific techniques among the many you use seem to work best? We use classic workshop and focus group methods and also work with cinema, writing, and other media. We are finding encouraging ways to work within communities, with people, to change the situation in which they live. This is not difficult, per se, if you bring religion in as part of the approach. For example, in our early work it was very difficult to raise the issue of domestic violence. There was denial even from women, but especially from men, who said that this does not happen in Kashmiri society. Women denied it also, saying that Islam gives equals status to men and women, using quotations from the Qur'an to show that domestic violence could not be. We continued to press on the issue, continued to engage with them, and slowly the space has opened up. Now, domestic violence is written and discussed in the media, and people are reporting it. There is no longer the assumption that, if you are a Muslim and follow Islam, violence will not happen to you. But the basic reality is that it is very difficult to question or critique things within a community if you have a lot of fear. The ability to transcend religious and ethnic identity is only possible if there is freedom from fear. So our in Yakjah and through the workshops that we have designed is to make efforts so as to focus on creating situations where people feel free from that kind of fear and can then transcend religion, ethnicity, and gender. When that happens, women can step into that space. How can women do that in the current situation of conflict? One thing I am pursuing personally is women’s political presence and hopefully we will be taking it as a major activity within Yakjah. It is important to open up space in the political, public domain. That is the central reason that I am making the film on women politicians. Public visibility is important and slowly things are changing. In the 2009 elections, 27 women contested, and three won. At the municipal level, where there is a reservation, a significant number of women presented themselves as councillors. We need to look at the conflict through their lens and encourage their public presence. As I have been interviewing political party workers, aspirants, and political workers about the topic of conflict and peace, religion is coming into the discourse in significant ways. There are also women engaged in the political peace process. We had an interesting exchange recently with the Home Minister. I wrote about our work and what we thought was needed, and eventually got a response, seeking ideas. We have worked on drafting a reply, setting out ways we believe can effect change. After much consultation, we have given them a draft letter with areas outlined where we can advance. The initial steps focus on addressing violence against women, but these need to be set in a broader framework, because women have to be in the decision making process, for all kinds of public policy making. Any kind of exclusion from any sphere of life, including her right to lead in religious affairs, we see as violence. Exclusion is violence, in the public and private areas. So we are working to identify the kinds of policies and steps that will allow women to feel secure at different levels. So along with our training of Sufi religious leaders, we are also training women in political participation. This addresses women corporators, at the municipal level, for different political parties. We have spoken to the State Commissioner for women. In this way, we are able to open up a public space for them. They can use the skills and resources we bring to them in different walks of life and in different work they are doing. A woman can be a real peace builder, even more if she can use religious (which I believe are cultural and spiritual) resources. We find that as we work with a woman resource person on a topic like legislation affecting women, she often uses religious resources, generally from the Sharia, because the region where we are working is Muslim majority and most participants are Muslim. So Islamic religious resources are used in explaining rights and other topics. What kind of support are you finding for your work? What networks are you finding useful and meaningful? We get support from Women Waging Peace and other groups, notably Peace Direct, a UK based organizations, in various forms. Training and skill building are an important start but the moral support of the networks is important. At times it is important just to know that members of the networks will understand your situation, and that other women are part of network, so that you can reach out to them. I am constantly in touch with some of the people I have met through these networks. We envisage and dream together. It is a kind of peace channel. One dream we have is to build this “peace channel” into a television channel, where we would have all kinds of peace building stories. That would truly bring women’s voices more into the discourse. The networks give us hope at times when we feel so down in the dumps. There are those times, because whatever you have built, crumbles, because of the political situation over which you have no control and which has nothing to do with the work you are doing. There is the constant fear of violence. There are divides along religious lines which can be accentuated by something that happens politically. So it is easy to feel that whatever you have built is not having impact. Because we are not part of the central discourse, we constantly have to reinvent what has to be done. Through these observations, I realize that political empowerment is really the most important. With more public visibility, lots of changes can happen. Together, we are helping to bring that kind of shift. And that way, the patriarchal structures can hopefully be dismantled. We are also working to form local partnerships and networks. Yakjah raises local resources and is supported by Peace Direct. It engages local peace builders. When they bring together local peace builders from other parts of the region, they are able to share and learn from each other’s experiences. Through Peace Directs’s Peace exchanges, one important means is the ability of women to share stories. I have come to know how powerful story telling is. Sharing stories is an important part of being empowered. Sharing personal spiritual experiences and relationships is also very encouraging to people. The religious resources that women use for peacebuilding which in essence stem from cultural, traditional and spiritual spaces are important. Women have shown leadership in drawing from local wisdoms and religious resources for negotiating responses to many forms of every day violence, healing, building relationships and peace constituency.